Braided leather bracelets/anklets are hand made in the USA using the finest quality premium full grain leather chosen for its strength and durability. Lobster clasp, clamps and split rings are nickel plated. Approximately 5/16" wide. 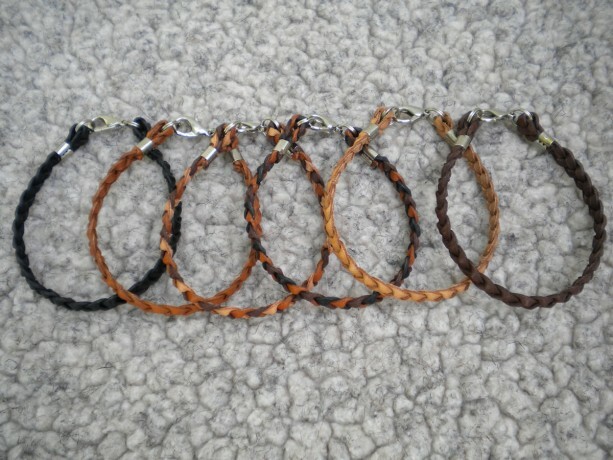 Six colors to choose from: Black, Saddle Tan, Light Multicolor, Dark Multicolor, Natural and Brown in five lengths: 6" to 10" (1 inch increments). Makes a great gift for women, men or children. Need a longer length? See our listing for Chokers or contact us for a quote on a custom length.